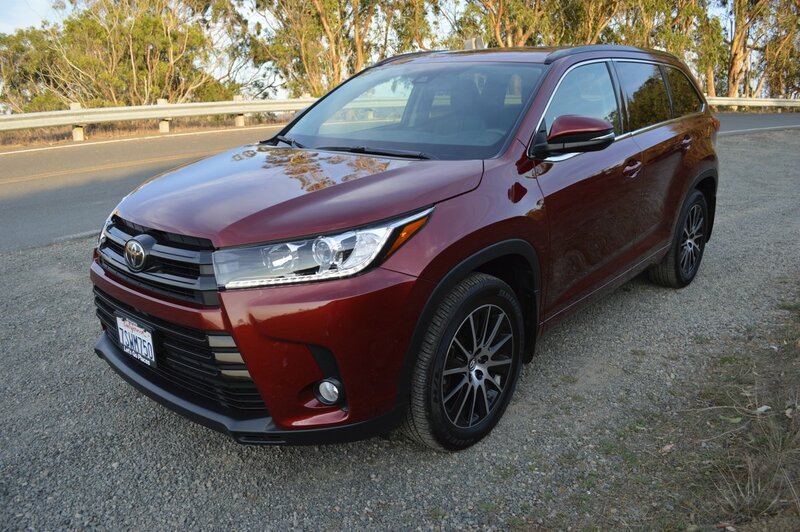 For 2017, Toyota undertook a major overhaul of the Highlander. The most visible change is to the front sheet metal. 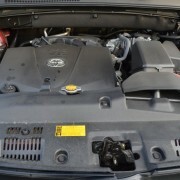 Toyota stylists replaced the previous version’s small one piece grill with a much larger triangular two-piece intake. 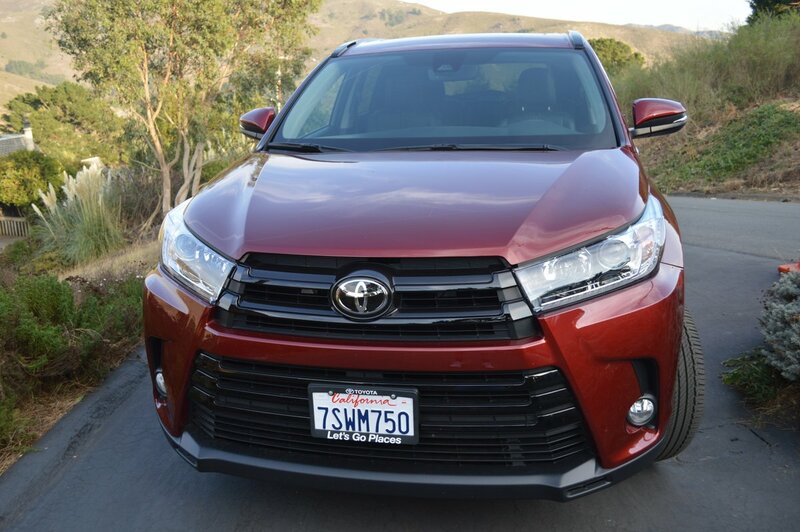 The enlarged grill endows the Highlander with a more imposing face. 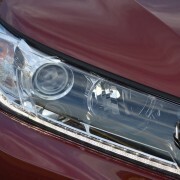 Side slots housing fog lights are reoriented from horizontal to vertical, further emphasizing the height of the new grill. 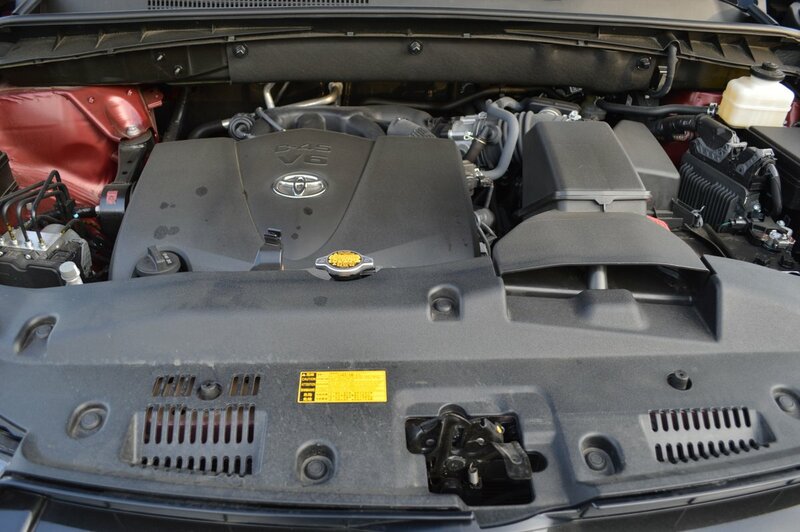 Behind the grill lies a newly revamped 3.5 liter V6 which boasts direct fuel injection rather than port injection. 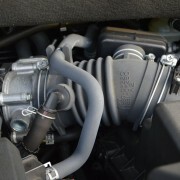 This engine produces 295hp and 263 lb.-ft. of torque. Also new for 2017 is an 8-speed automatic transmission (up from the previous model’s 6-speed). 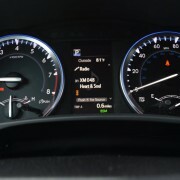 The two extra gear sets improve fuel economy by reducing engine rpm at highway cruising speed. 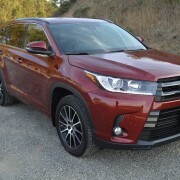 Where the previous Highlander returned 18 MPG/24 MPG, the new V6/8-Speed combo yields 20 MPG in city driving, 26 MPG in highway mode and 22 MPG overall. 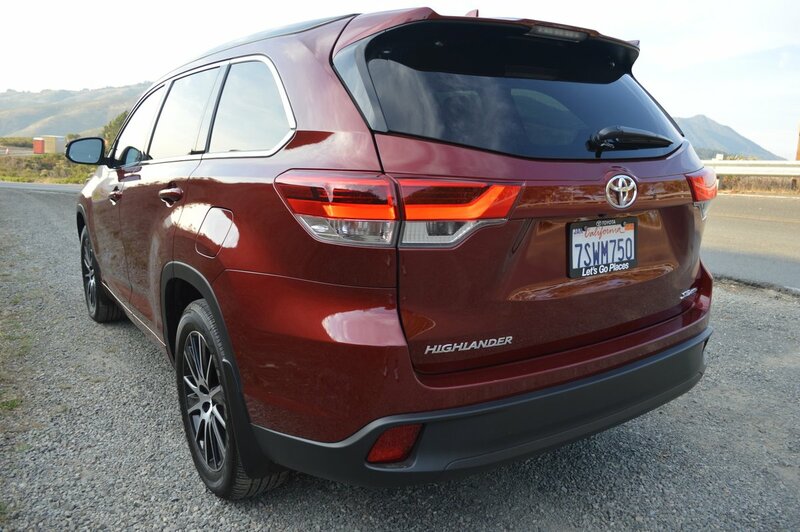 One reason for the Highlander’s continued popularity is its utilitarian configuration. 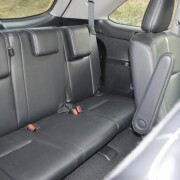 This is a truly useful 3 row seating design. 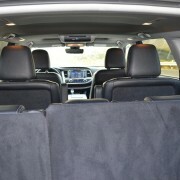 If you chose a second row bench, you can carry 7 people in the Highlander’s sizeable interior. 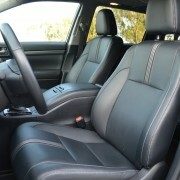 Our test model , however, sported very comfortable second row Captain’s Chairs which reduced total seating to 6. These second row chairs slide fore and aft to permit easy access to the third row seats. 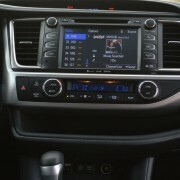 Our test vehicle also included an $1,810 rear seat BlueRay DVD entertainment system. This unit provides headphones as well as a remote control box. 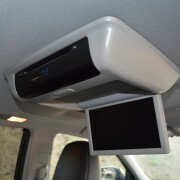 Note that when the DVD player is swung down for use, its screen blocks rear view mirror vision for the driver. 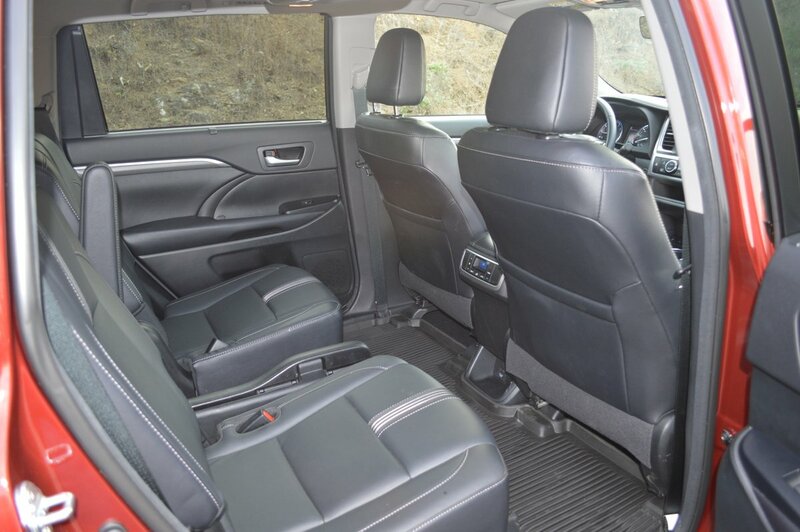 If you flip and fold all seats down – a relatively painless procedure – you generate 40.5 cubic feet of interior storage space. In anticipation of a trip to Home Depot for some wood, I placed a tape measure inside the Highlander and discovered enough front-to-rear interior space to accommodate a 7′ long piece of timber. If you need to transport longer material, you can run with the tailgate down, or simply flip the rear tailgate window up while leaving the lower door upright. 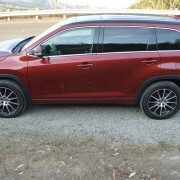 The Highlander is also tow rated at 5,000 pounds, so its utilitarian portfolio is quite complete. 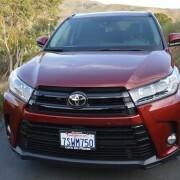 About the only thing this Toyota fails to provide is fun behind the wheel. 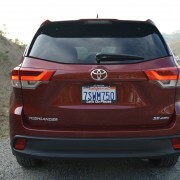 Although the Highlander’s window sticker claims that this crossover is fitted with a “Sport Tuned” suspension, the Highlander is just too heavy (4,570 lbs.) and too big (191 in. long) to generate anything resembling sporting performance. 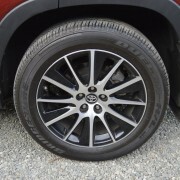 To its credit, Toyota provides rather hefty contact patches at the road, with 245/55R19 Bridgestone Dueler H/L tires at each corner. But the suspension is rather flaccid as it pitches from side to side through switchbacks. 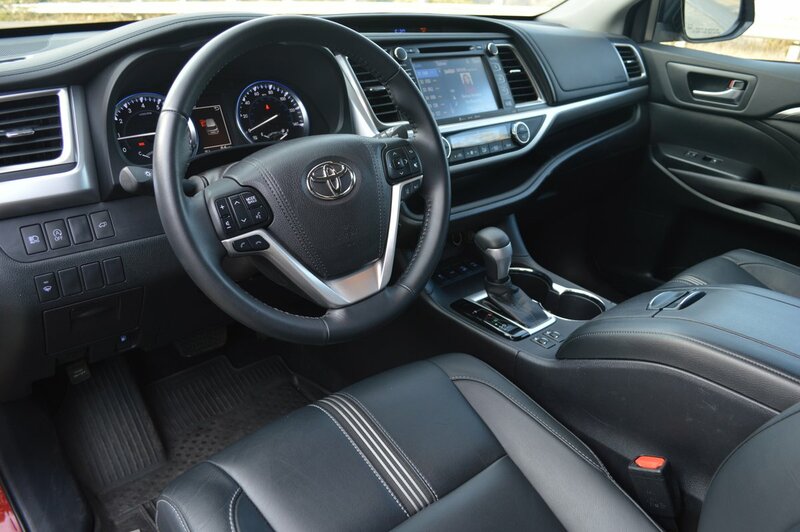 The 295hp engine, with its middling power to weight ratio of 15.5lb/hp, is hard pressed to provide significant acceleration, even when you hammer the throttle with that 8-speed transmission locked in second or third gear for maximum thrust. Also new for 2017 is the inclusion of Toyota’s Safety Sense P suite of warning devices and collision avoidance mechanisms. 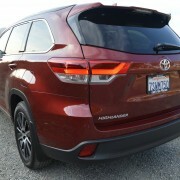 Some of the highlights include pre-collision system with pedestrian detection, lane departure alert (LDA) with steering assist, dynamic cruise control and “automatic high beams.” I turned off the LDA, as I tend to pay close attention to adjacent traffic. The radar cruise control operated smoothly and unobtrusively, offering 3 different car length settings for following distance. 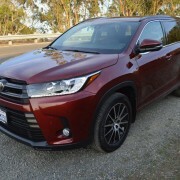 Even the one-car-length setting, however, dropped the Highlander at least 3 car lengths behind the nearest car or truck, which provided other drivers the unwelcome opportunity to chop in front of the Highlander. 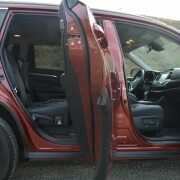 But the automatic high beams proved perplexing. On my first night drive in this Toyota, I found I could not activate the high beams when I needed them. 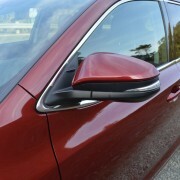 I later discovered that a dash button had been depressed to activate the automatic high beam feature, which “uses a camera sensor behind the upper portion of the windshield to assess the brightness of the lights of vehicles ahead, streetlights, etc., and automatically turns the high beams on and off as necessary.” This so-called “Safety Sense” feature, which countermanded my own decision making process, should be permanently deleted. 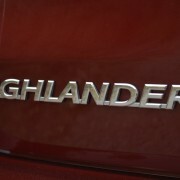 In the big picture of Highlander ownership, though, it’s a minor speed bump on a long fast stretch of highway.